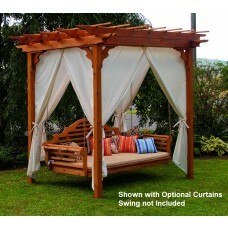 Porch swing frames give you the freedom to hang your porch swing or swing bed wherever you please. They're sturdy, reliable, and built for the purpose of holding your wooden swing, which means that you never have to worry about whether or not you've hung your swing safely. It's the no-fuss way to get the job done. 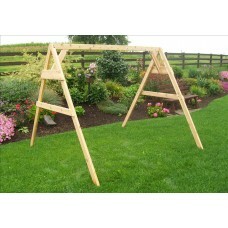 We have both A-frame swings and pergolas which will accommodate entire swing beds. Shop our entire selection now. Most of our swing frames are made out of cedar, which is a hearty hardwood more than capable of withstanding the rigors of outdoor living. Cedar is naturally insect resistant, and it resists water damage, as well. These swing frames are each easy to install and put together, and the built-in swing hangers make it very easy for you to start enjoying your porch swing or swing bed right away. Each of our sturdy frames fits firmly into your back yard space. Each swing frame can hold a great deal of weight, as well. If you've already purchased your porch swing then don't forget to pick up one of these sturdy frames. Where are you going to swing your days away? Shop now and decide today!